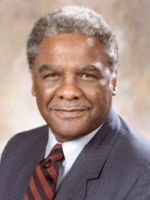 Info Harold Washington (1922-1987) was the first African-American mayor of Chicago. Born in Cook County Hospital on April 15, 1922, Harold Washington lived on the South Side for all his early life. He worked in a meat packing company until joining the Army in 1942. After his discharge, he entered Roosevelt College, one of the few schools allowing enrollment of Blacks. He was elected class president in 1948, and in 1952 graduated from Northwestern University Law School. Washington entered the world of politics in 1954 as corporation counsel for the 3rd Ward democratic organization. He organized the Young Democrats, which grew into a powerful organization for minorities. In 1964, he was elected to the Illinois House of Representatives. During his time in the legislature, he sponsored many anti-discrimination bills and was instrumental in having Martin Luther King's birthday recognized as a holiday in Illinois. In 1972, Washington served 36 days in Cook County Jail for failure to file an income tax return for four years. Washington ran for mayor shortly after Richard J. Daley's death in 1976, but was largely unnoticed, recieving only 11 percent of the vote. In 1977, he won a seat in the state senate, and became U.S. representative in 1980, reelected in 1982. Washington ran for mayor again in 1983, and defeated Mayor Jane Byrne in the Democratic primary. He then went on to defeat Republican Bernard Epton. As mayor, Washington was bitterly opposed by alderman Ed Vrdolyak, who controlled a majority of the city council. Vrdolyak's block consistently voted against Washington at every opportunity. Court-ordered redistricting in 1985 reduced Vrdolyak's majority, giving Washington a majority. Washington won re-election in 1987, but was struck down by a heart attack on November 25th. His body lay in state in city hall. Services were held in Christ Universal Temple on south Ashland. On Novmber 30th, he was interred at Oak Woods.